Katie is incredibly affectionate. She will climb onto your lap before you know it; and her purr tells you how happy she is to be with you. She and her littermate sister, Angel, attend many shows together. She has taken home many rosettes (see Recent Accomplishments below). Katie earned the distinction of BEST ALTER IN CANADA for the 2003-2004 show season! Thank you to Heather and Morley for taking her out and showing her so beautifully and proudly! Katie is also a Grand Premier in CFA, making enough points in one show to take her all the way! 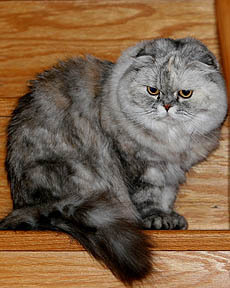 At home, Katie shares her time between Heather and Morley, her half-brother MacGregor, and her half-sister, Bonnie. Best of the Best Premier at the Good News Cat Club show in Acton on August 10, 2003. 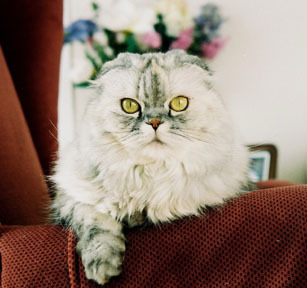 Best of the Best Premier at the Canadian National Cat Club show in Toronto on August 24, 2003. 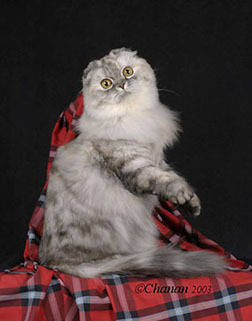 Became a Grand Premier at the Canadian National Cat Club show in Toronto on August 24, 2003. Best of the Best at the Belleville show for Sunday, October 26th. gentle music and constant shows of affection."